See also our publications page. The website has transitioned to Scientific Linux on real server hardware in the UofM School of Physics & Astronomy server room. We hope this change will improve reliability of the service. On our Treasury Project Software page we have recently released our exfits and fitstools. exfits is software to extract 1D spectra from 2D HST STIS spectra. fitstools is a software library that is required to run exfits which wraps and extends the functions included in the NASA FITSIO libraries. This month we are nearing the completion of the MAMA data processing. We are also getting close to finishing splicing together the separate grating tilts for the CCD data. Both data products should be available in our archive sometime in August 2006. At the end of this month John Martin will be leaving the Minnesota Treasury Project team to start a tenure track position at The University of Illinois Springfield. An updated version of our online archive is now available at http://etacar.umn.edu/archive. Specially combined ACS HRC images have been added to a searchable image database. The spectra portion of the database now includes VLT/UVES spectra of the Homunculus and central star taken between 1999 and 2006 covering 3000 - 10,000 Angstroms. There is also new documentation that describes the new portions of the database. We presented a poster on resolved spectroscopy of the NW Homunuculus Cap at the June AAS Meeting in Calgary. A copy of that poster is available online on the Treasury Project publications page. We have granted HST time in Cycles 15 and 16 to continue monitoring Eta Car with the ACS/HRC. We have written two new Technical Memos. The first, Technical Memo #12, describes work using interstellar absorption features to verify the accuracy of the non-standard WAVCALs performed on some of the Treasury Project data. The second,Technical Memo #13, describes a previously undocumented variable fringing feature in STIS/CCD spectra taken with the G750M grating near 9750 AA. In a spectrum as rich as Eta Car's, normally one doesn't worry much about features that haven't yet been classified. We've noticed, however, that an unidentified emission line near 6307 AA has unique and probably significant characteristics. Among other peculiarities, it indicates serious fluctuations during the middle of Eta's 5.5-year cycle, when most theories predict steady behavior. Our paper reporting this case, "Variable Unidentified Emission Near 6307 AA in Eta Carinae" will appear in the May 2006 issue of the PASP. Preprints are available online at http://arxiv.org/abs/astro-ph/0603168. February 2006: Eclipse Model Eclipsed? Eta Car's spectroscopic events, such as the one that occurred in mid-2003, have not really been explained yet. Most authors have favored an "eclipse model" (really just a qualitative scenario) wherein each event occurs when a hot secondary star moves behind the primary star's dense wind. The alternative, a mass ejection phenomenon, has received far less publicity. This is ironic, because the latter idea was proposed years earlier and, if true, has more significance for astrophysics. (For details see, e.g., the "publications" page of this website.) A mass-ejection theory requires an undiagnosed instability in the star's outer layers, perhaps triggered by a companion star; while an eclipse or shadowing event would be relatively superficial. Arguably the highest near-term priority in this topic is to establish whether a mass-ejection event occurs during each event; if it does, a possible eclipse at about the same time is merely of secondary importance. As we now recognize, Treasury Project data strongly favor some form of mass-ejection. Ephemeral HeII 4687 AA emission (which we didn't know about when the project was planned) turns out to be particularly significant. Our paper on the HeII emission will appear in the 20 March 2006 Astrophysical Journal; a preprint can be downloaded here. For the most essential results, skip to Section 9 there. (This subject is rife with irony. When Steiner and Damineli first reported strong HeII emission in 2004, they portrayed it as support for an eclipse model -- but closer analysis leads to precisely the opposite conclusion. Other evidence, also of an unforeseen nature, appeared in FUV data late last year, see the poster mentioned on this page in January. A small error affecting the reference rows determined for certain observations of the Weigelt D blob has been corrected. This error caused the position on the slit relative to the position in the nebula to be miscalculated with an error on the order of 0.05 arc seconds. The CRPIX2 WCS variable was changed in 149 of the FITS files in the database. Version 1.2 of the Release Notes is updated to reflect this change (see section 2.i of that document). We have delivered the STIS CCD data to STScI for inclusion in the MAST database as a High Level Science Product. The other poster is novel because it reports measurements made in spectroscopic data, not standard ACS or WFPC2 images. There has been a dispute about the ejection date of certain gas near Eta Car -- was it ejected around 1840, or 1900, or even 1940? Several authors have reported mutually discordant proper-motion measurements based on HST imaging. In a normal image of Eta Car's ejecta, each "blob" can be a mixture of local emission lines and reflected stellar light -- and there is no fundamental reason for the two components to move at the same speed. We even know that some cases include separate emission-line components with different speeds. In principle, therefore, only spectroscopic images can be trusted for this purpose. SlackerAstronomy.org did a podcast on Eta Car this month. That link is here. The software package replacenan was added to the software download area. We announce the first public release of HST STIS CCD data from the HST Treasury Program on Eta Carinae. The archive can be accessed here and the release notes are available here. The posters presented by the Treasury Project team at the 206th meeting of the AAS are online in the posters section of the TP publications page. We proudly announce that the first public release of the STIS/CCD data (Version 1.2) will be made on May 29th. The ghostbgone software which removes the H-alpha ghost from the STIS/CCD 2D spectra is now available in the software download area. All the classical WAVE HDUs have been removed from the data in the archive because that has been supserceded by the WCS information in the FLUX HDU. For software to reconstruct the WAVE HDUs, see the Treasury Project software page. A paper was submitted to the ApJ about our investigation of the emission feature we presume is He II 4686 in Eta Car's Spectrum. A preprint can be found as astro-ph/0504151. The latest data from the HST ACS/HRC camera shows that the central star continues to brighten at an accelerated rate. Between November 2003 and December 2004 the continuum brightness increased by 0.2 magnitudes. Get the full story here. A paper on the Balmer H-alpha line written with the Eta Carinae VLT/UVES collaboration is in the March 2005 Astronomical Journal. The three posters presented at the 205th AAS Meeting in San Diego are now online on the publications page. Two new technical memos (#8 and #10) have been added to the Treasury Project Technical Memos page. November 2004: A Change in the Physical State of Eta Carinae? A new pre-print is available from the Eta Carinae Treasury Program. During Eta Car's spectroscopic event in mid-2003, the stellar wind's bright H-alpha and H-beta emission lines temporarily had a distinctive shape unlike that reported on any previous occasion, and particularly unlike the 1997-98 event. 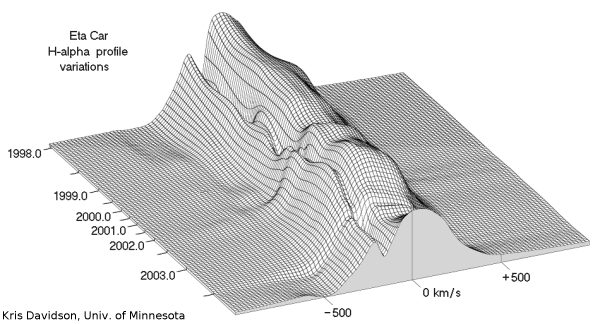 Evidently the structure of the wind changed between 1997 and 2003. Combining this with other evidence, we suspect that the star may now be passing through a rapid stage in its recovery from the Great Eruption seen 160 years ago. In any case the data indicate that successive spectroscopic events differ, and the hydrogen line profiles are quantitative clues to the abnormal structure of the wind during a spectroscopic event. There are two new movies available that show variation in the helium line. A 2D version (5.4 MB) and a 3D wire grid (11MB) are available. A new version of the archive is now available. Please read the release notes, available on the publications page. The AAVSO website has a article about John Martin's and Michael Koppelman's recent paper on Eta Carinae, "Eta Carinae's Brightness Variations Since 1998: HST Observations of the Central Star". This movie (Download: QuickTime 12M, AVI 63M) demonstrates the dramatic changes taking place in the H-alpha line during Eta's 1998 to 2003 cycle. An unexpected variety of changes occurred during 2003 and the profile did not repeat what it did 5.5 years earlier. Stop by our posters at the AAS meeting in Atlanta. We are in Session 4 on Monday and Session 83 on Wednesday. Note: the AAS schedule incorrectly lists these posters as appearing in Session 58. However, many interesting new results will appear in Session 58 (Eta Car). December 2003: New Material In The Works! In the last half of 2003 we have been busy working with the data and preparing some of the results from the 2003 event. However, during January we will be adding at least one new paper, several posters from the January AAS meeting, information on the spectral changes six months ago and several technical reports on data procedures. Opinions expressed here are those of KD and do not necessarily represent the views of all T.P. CoI's. Eta's 2003 event occurred on schedule during April--July: high-excitation emission lines disappeared as expected, the hard X-rays quavered and peaked and then plunged, etc. Unlike the 1997 and earlier events, however, this time we have obtained HST/STIS data with high spatial resolution and ultraviolet coverage. 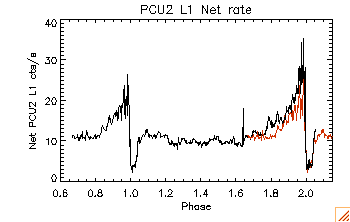 This time, after analyzing these data we will be able to say what the star did and what the nearby ejecta did, at wavelengths from 1700 to almost 10000 � -- absolutely essential for understanding the phenomenon. Most of the STIS observations, supplemented by new HST images, have been achieved without any serious failures. However, as one of the most complex sets of data ever obtained with the HST, they require extraordinary processing and examination; so we obviously cannot report the details yet. Occasionally, as we work through the analysis, we may add some results to this web site. This figure shows the 4-10 keV X-ray flux to June 25, adapted from Mike Corcoran's www site. After that, at least to mid-July, the flux did exactly what you'd expect from the figure: It declined to nearly zero and stayed there a while. Guessing from the 1997-98 precedent, recovery should begin in August. These hard X-rays almost certainly originate in hot gas that has passed through a shock front. Most authors assume that this occurs at an interface where two stellar winds in a binary system collide, but a single-star model with fast and slow wind streams cannot yet be ruled out. An interesting development is the brevity of each flare in May and June -- only about 4 days between half-maximum levels. Considering the size of the large-scale shock structure and the characteristic propagation speeds within the shocked gas, four days is just about as fast as a major flare can occur in almost any normal scenario. Therefore the new observations have already provided a valuable constraint on models. A short timescale tends to favor the generic colliding-wind binary as opposed to at least the most obvious types of single-star model. Anyway, Corcoran's daily sampling turns out to have been wise; during the 1997 event, flare peaks presumably occurred between the weekly observations. The last sharp flare in mid-June was a little surprising. Judging from the 1997 event, the decline at the beginning of June briefly seemed to be the final plunge -- but it wasn't. Six years ago we suspected that each "event" might be an eclipse of one star in a binary system by the other, or an eclipse of the X-ray region, and some authors still use that term. However, in 1998 the early HST/STIS data made that type of model unlikely (see refs. cited elsewhere in this www site), and now the X-rays in 2003 are hard to interpret as any sort of eclipse. The situation is far more subtle than that, and therefore more interesting. Few if any aspects of the event are really understood at this time; the mere incantation "binary system" doesn't explain the wide variety of unusual effects observed at photon energies ranging from 0.03 eV to 10 keV. Some qualitative binary models, each proposed to account for one particular effect, are mutually exclusive! In the opinion of this page's author (KD), the sharp flares indicate a general disintegration of the shock structure. During May--June it became catastrophically unstable and its morphology changed, due to a rapid increase in ambient gas density. An important question is why the density increased so quickly; crude estimates and STIS data suggest that it wasn't merely because a secondary star moved deeper into the primary wind. See brief review article in a book: The High Energy Universe at Sharp Focus: Chandra Science, ASP Conf. Ser. 262 (ed. Schlegel & Vrtilek, 2002), p. 267. However, it's important to remember that the 5.5-year cycle is not primarily an X-ray affair. The 2-10 keV X-rays carry only about 0.001% of Eta's total luminosity, and only 1/1000 as much energy as the primary wind. Hundreds of individual emission lines observed with the HST/STIS each represent at least as much energy flux as the hard X-ray total. Moreover, although the X-ray physics problem is by no means solved, it does not currently appear as strange, fundamental, or difficult as several of the other major puzzles. 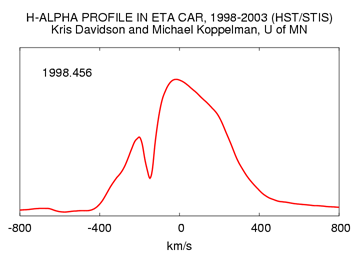 If Eta Car is a colliding-wind binary, then an "event" most likely occurs near periastron (closest approach). Most likely the primary wind -- which is not isotropic or spherical! -- is temporarily altered by a synergistic combination of tidal, radiation, and rotational effects. Note, however, that a single-star model has not yet been excluded. In that case we omit the tidal effects, and the 5.5-year period may represent a thermal, rotational, and conceivably even magnetic recovery cycle following each unstable episode. See refs. cited elsewhere in this www site. As noted earlier above, our March--July HST Treasury Project observations occurred without any serious mishaps, but the data are intrinsically so complex that we cannot describe results yet. Suffice to say that Eta is still open for business, and that it is undergoing a complicated spectroscopic event whose fundamental causes are not yet understood.